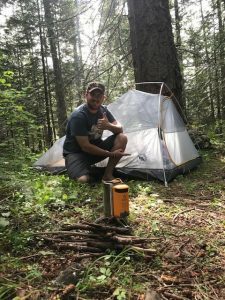 Today’s backpackers, backcountry hunters, minimalist campers are all obsessed with saving weight. Many of them create packing lists in terms of ounces rather than items. Luckily we live in a time where you can still have most of your essential items and stay in a weight range that does not break your back. Gone are the days of having the only option as cast iron pans and canvas tents and thank goodness for that! Speaking of tents, this may be the single most important piece of gear that you pack. Shelter is the number one priority for survival and so it stands to reason that we would want to have a good setup. The problem is not the lack of amazing tents out there, but rather the selection of truly lightweight tents. Lucky for us Big Agnes knows a thing or two about lightweight gear. The Fly Creek HV UL2 mtnGLO is a full three season shelter that only weighs an astonishing 2.6 pounds! So, shelter is important, that is no doubt something we can all agree on. 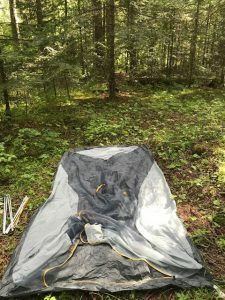 Shelter can be as simple as a tarp to keep you out of the elements or a net to keep you away from the bugs. Either way we need some type of shelter if we plan to spend a lot of time outside. The Fly Creek HV UL2 mtnGLO is a great option for either of the aforementioned uses. It can be used as a shelter from the elements or as a simple shelter from the creepy crawlies. This tent is multipurpose and can be set up to meet your specific needs. If the weather is nice and you want a view of the stars simply leave the cover off and enjoy that fresh air. The rainfly and storage bag also work as a makeshift pillow in the event that you forget yours like I did. Set up of this tent is about as self-explanatory as it gets. You just lay it out and attach the poles in the only hole they will go into. If you have the footprint, which I highly suggest getting, you would still follow the same method. 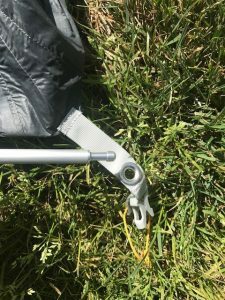 The footprint will help protect the bottom of your tent and keep it water resistant and free of holes. The tents lightweight fabric, while tough, is very thin and having a footprint will help bring some peace of mind. 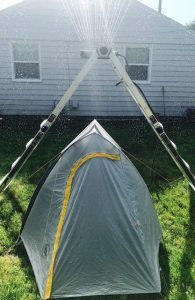 It also will help to keep the tree sap off your tent. I did not have the footprint on this trip and regretted it. 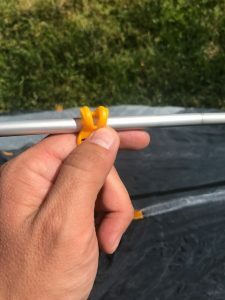 After laying out the tent and connecting the poles its time to attach the small clips found on the top/roof of the tent. They are simply clipped onto the poles. No need to over think this as they pretty much only clip into the spot they are supposed to be. After the poles are clipped in there are two stake out points at the back that need to be secured and the tent is up and ready to be enjoyed! One thing that I always do when I get a new piece of gear is test it out at home before I ever take it to the field. I wanted to make sure that the tent was not going to leak all over me in the event of a rainstorm. The summer heat of eastern Washington was not really helping me test that so I had to enlist my ladder and a sprinkler to simulate some rain. I am happy to report that after 2 hours of a constant downpour the tent interior was completely dry. I found that the two person rating Fly Creek HV UL2 mtnGLO is a bit of a stretch. I originally thought this after I set it up at home but it became very clear after my first outing. 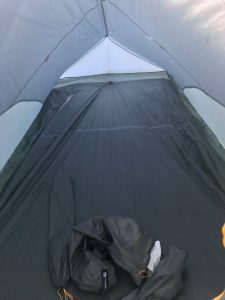 As I sat in the tent on the first night of my trip I found it to be very comfortable for just one person and would not be in a hurry to share the space. The Fly Creek HV UL2 is set up in a shape similar to a mummy bag with the foot area being smaller than the entrance. It makes for tight quarters and I’m only 5’ 9’’. If you plane to use this tent for 2 most of the time I think you might be ok with the additional 9 oz. that it takes to buy the UL3. The space would be worth it in my opinion. The usable space is extended a bit when the fly is on as it creates a vestibule for storage of gear. So, it’s not that this tent won’t hold two people it’s just that you will be nice and close. 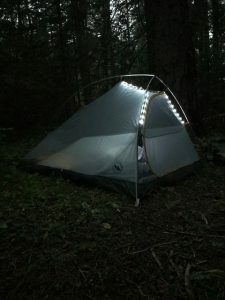 One of the coolest features of the Fly Creek HV UL2 mtnGLO is the integrated LED lights that follow the seams along the top of the tent near the entrance. A small battery pack sits on the side of the tent. This is the power source for these great lights and let me tell you they are awesome! Gone are the days of searching for that headlamp or flashlight. This is particularly important as the tight space of this tent would make that a real chore. I absolutely love this lighting option and think it is worth the couple of ounces. 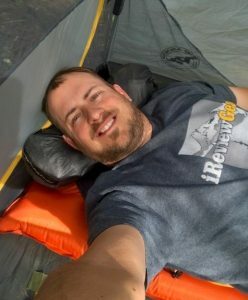 The Fly Creek HV UL2 mtnGLO is a great little tent. It is lightweight, easy to set up, and has some great features. 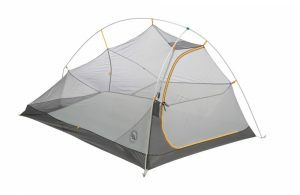 It would work as a solo tent with room for all your gear or as the name suggests it can sleep two. The material is consistent with that of today’s high quality fabrics. 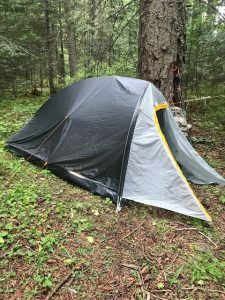 The tent is both nice looking and functional and although that is not important to some there are those who like a nice looking tent. 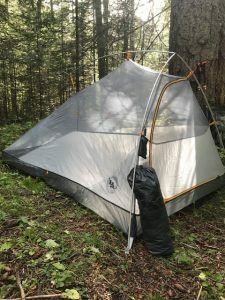 The Fly Creek HV UL2 mtnGLO is a very nice tent for spring/summer/fall backpacking and I think a person would be very happy both carrying it and sleeping inside. This tent is a pretty sold choice. I could find no real issues with anything mechanically I.E. zippers, poles, clips, materials, and nothing complicated about set up. I feel that it is a bit tight for two people but that is my personal preference. The tent keeps water and bugs out and also has that great mtnGLO lighting. The price is consistent with tents from other manufactures of comparable quality. I really just don’t know what I would do differently other than eat the additional 9 ounces and step up to the UL3 for the added space. Can’t hold that against this tent though. It’s simple and preforms as advertised. The Fly Creek HV UL2 mtnGLO is a solid 5 star product from a 5 Star company in my eyes.